We're back after renovating!!! Guests are encouraged to contact us before booking with any questions. This rental includes most of our home: large kitchen, living room, two bedrooms, two bathrooms all on the main floor oriented towards the ocean, in addition to the spacious downstairs TV room (60" TV), office with a double sofa bed suitable for children, and laundry room. Guests can enjoy the use of all the extensive grounds, all decks and the private pathway to the beach. See photos. There is an independent studio suite downstairs with its own private and separate entrance which we reserve for our use. We spend much of July/August on the West coast and may return to this suite from time to time. By choosing our home, (7 day minimum: Sat. to Sat.) you and your family will enjoy the countless recreational activities (sailing, kayaking, fishing, golfing, tennis, hiking, etc.) of the Comox Valley from the comfort of this spacious 2800 sq. ft. two bedroom home located on 1.25 acres at the tip of Cape Lazo, just 8 kilometres from Comox. Its two-level, post and beam design with natural cedar ceilings creates a warm ambiance for everyone. On the main floor, expansive picture windows provide panoramic views of the Salish Sea, numerous islands, and the magnificent snow-capped mountain ranges of Vancouver Island and the Mainland. Gather around the Island in the spacious and well equipped kitchen with adjacent deck and BBQ. If you are an “early bird”, catch the sunrise while sipping your morning coffee on the front east facing deck overlooking the sandy beach below, and delight in the abundant marine life: eagles, herons, sea lions or the occasional pod of Orcas. From the deck, follow the private path that very gently winds to the secluded sandy beach where one can walk for miles or explore the tidal pools. For the swimmer, the water in the summer gets warm especially when the high tide comes in over the hot sand during the day. It's considered one of the best beaches in the Comox Valley, and since the public access is a fairly long walk away, it's very secluded. Relax with a good book in the shade of the fruit trees, or get some exercise playing bocce in our private back yard bordered by tall rhododendrons, and often frequented by deer. Enjoy the evening sunset over Mt. Washington (watch it from the sunset deck off the Master bedroom) and the moon rise over the water from the front deck where the day began. The fully lit cruise ships bound for Alaska will mesmerize as you contemplate another relaxing day in paradise. We book Saturday to Saturday and accept a variety of payment options. Please email us for more information. My husband and I are retired teachers who have lived in the Comox Valley since 1973. We love the area and really enjoy all the recreational activities at our doorstep. We have raised our family here and can't imagine living anywhere else. Although we love to travel, our favourite place to be is home. Our property offers stunning views, sunrise over the ocean and sunset over the mountains, complete privacy, a huge yard, decks all across the ocean side of the house, and a sunset deck with garden, mountain and ocean views off the master bedroom. From the deck overlooking the ocean, a gentle trail leads to a secluded sandy beach that goes for miles. It is great for walking, swimming, and exploring the marine life. The sandy beach below our home is considered to be one the best in the Comox Valley. The water is warm for swimming and deepens gradually making it safe for children. As the tide lowers, a reef is exposed providing the opportunity to further explore marine life. Eagles, ravens, whales, seals, and dolphins share the neighbourhood. Kye Bay Beach, with a play area for children, is minutes away by car. It is also walkable by beach from the foot of our trail that gently zigzags down the bank from our home. We have a huge, private back yard for the kids to run around in safely, and there are decks with ocean, mountain, flower garden views all around the house: 360 degree views with both the sunrise and the sunset. 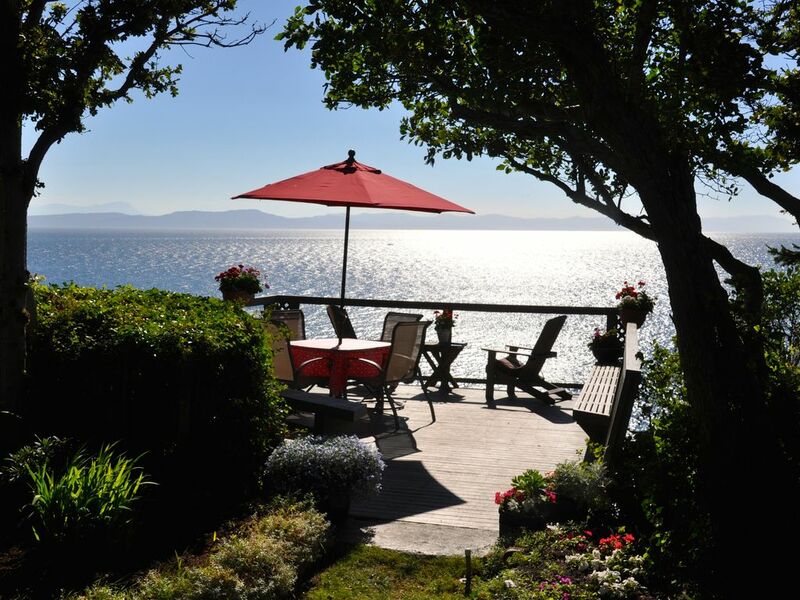 We are lucky to live in a very special spot in the Comox Valley, and are happy to share so you can make wonderful memories of a great vacation with your family and friends. Comox is about 6km or 7 min by car, 15 minutes by bike. Beautiful little town with great restaurants, marina, parks, art galleries, shopping mall, liquor store etc. The easy to walk trail from our deck zigzags to the sandy beach. Point Holmes boat launch is minutes away by car with a lovely wide walking path along the beach. Mt. Washington Ski Resort great for skiing in the winter and hiking in the summer. We have a view of Mt. Washington from our house; 45 minutes drive to the chairlift. About 7 minutes by car from Comox, rural in nature; our property is 1.25 acres with complete privacy from neighbours and the road. Our house is perched above a secluded sandy beach, excellent for swimming. We have a trail on our property that gently zig zags down to the beach. The front, east facing deck overlooks the beach. Great views of the Coastal Mountains across the Strait and the Beaufort Range of Vancouver Island including Mt. Washington. Great ocean views from the kitchen, dining room, living room, all front decks, and the master bedroom with its own west facing garden/ocean/mountain/sunset view deck. We are on the ocean but perched above it. The front deck with the umbrella overlooks the beach itself. The decks attached to the house have ocean views as do the main living areas of the house. We spent the most wonderful time in this beautiful house in Kaybay! When we arrived in the night, we just caught a glimpse of the lovely interior and tasteful decoration inside and went straight away into bed. The next morning was so overwhelming: we were welcomed with deer in the garden and we enjoyed our coffee with a breathtaking view over the ocean from the patio. We made our way down to the beach and listened to the seals and birds (the extraordinary thing is that you have your own private walk way to the beach). The house is very spacious and cosy and we did not miss a thing. It doesn't matter which room you enter, you are always stunned by the brillant view- to the ocean or into the garden. The location of the house is very good- you are nearby to Comox and it's fantastic to explore the whole costal side up north and south towards Victoria. Whenever we had a question, our very kind hosts Dale and Don were absolutely supporting. They gave us so many ideas what to see and what to visit. All in all I have to say that we were very lucky to find this great place and we will definitely book again whenever we get the chance to visit Vancouver Island again! Beautiful home, perfect beach, fantastic - we'd give it 10 stars If we could! Bright, light, modern beach front home with stunning views, impeccably kept gardens, a very private, Sandy, calm water beach. Tide pools to explore and lots of adventures nearby. We spent a wonderful week, so grateful to Dale and Don for opening their home and sharing the gem with our family. Thank you and we hope to be back next summer!! Our family, really enjoys our time here. We have it as a standing vacation spot for our family. The location is great, market and amazing beach down the road, yet secluded that you feel like you are away from it all. There is lots of space, with a beautiful yard and all the amenities and things you nee dot make amazing meals and have great nights sleep. Wonderful for entertaining people. We are so lucky to have found this gem. Stunning property in a perfect location. A beautiful house on a stunning lot! The views are incredible; there is so much outdoor space to play, with decks, fruit trees and a swing for the children to play on. The house has everything you need and is spotlessly clean and excellently maintained. The owners are absolutely lovely. There is lots to see and do in the area. I highly recommended this property. Ugh! We hated to pack up and leave! We had the trip of our lives! Thank you so much for beautiful accommodations. Your home, flowers and the view are all lovely! We walked your beach, enjoyed the sunsets off the back patio, caught a king salmon and ling-cod on a charter, hiked Goose Spit, Seal Bay and Mt. Washington. Also, enjoyed a trip over to Tofino. Your place is amazing! The views are unparalleled, the kitchen and house gorgeous and so relaxing! Hope we get to share it again with our boys someday! Everything We Needed for a Relaxing Holiday!!! Lovely, very well equipped home. Glorious ocean views, beautiful gardens and plenty of space to get comfortable in. Easy communication with kind, gracious hosts. One of our best holiday experiences ever! Highly recommended!!! The Comox Valley is a very vibrant community set in a valley between the Beaufort Mountain Range and the ocean, or Salish Strait, a protected body of water between the East coast of Vancouver Island and the Mainland. It is rich in the Arts, Theatre, Music, has great restaurants and also offers the opportunity for every kind of recreational sport imaginable on water or land. The beauty of the Valley is unequaled as mountain and ocean views from just about anywhere abound. There are daily flights into Comox and the nearest ferry to Nanaimo (1.5 hrs. from Comox) from Vancouver is a beautiful way to arrive on Vancouver Island. Google Comox Valley, BC and explore the many websites to find out more about our wonderful region. Minimum 7 night stay: Saturday to Saturday. We accept a variety of payment options. There is an airport nearby so guests can fly to Comox. Email us for more information.